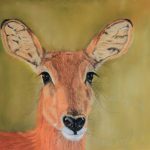 Judith jointed the Art Safari Wildlife painting holiday to Zambia. 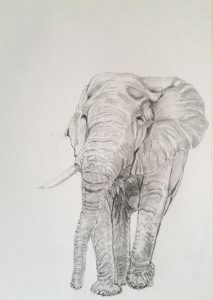 She had the opportunity to explore and sketch many animals in their native habitat of the South Luangwa National Park. The folks at Art Safari Wildlife Painting Holidays, make the experience as memorable as possible allow artists to focus on sketching and painting, while they take care of everything else. This is a fabulous event run by the Royal Geographic Society of the UK. The aim of the exhibition is to raise vital awareness about the threat of extinction to some of Africa’s most iconic species. Artists have been invited to donate sketches and artwork that will be sold via an online Silent Auction. Money raised by the Royal Society will be donated to projects including, David Sheldrick Wildlife Trust, Animals saving Animals, Rhino Conservation Botswana (RCB), Il Pejeta Conservancy Kenya, and The Real Africa Trust. Judith has donated three of her sketches to the organisation. Please follow the news section of the website for more information. The vision of this Kent (UK) based organisation is to assist with the conservation of the world-s endangered big cats. They achieve this by helping preserve breeding integrity, and where possible, assist in the returning of big cats back to the wild of their native lands. 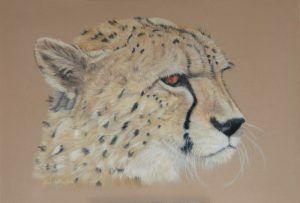 Judith’s Cheetah was inspired by encounter I had at the Sanctuary with one of their majestic cats. This fabulous group began life as a 52-week Nature Painting Challenege, founded by Kitty Harvill and her husband Christoph Hrdina. The group has transitioned in to Artists and Biologists Unite for Nature (ABUN) which has a more specific mandate of focusing on projects that help and support conservation of endangered species and their respective natural habitats. 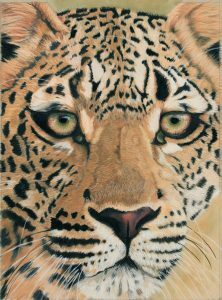 Judith’s Ingwe the Leopard was used by ABUN in their “Living in Harmony” exhibition in South Africa, to help local farmers and villagers find a way to live alongside these beautiful predators. More information about the group and some of their recent projects can be found in the Endangered Species section of this website.